First of the Season. 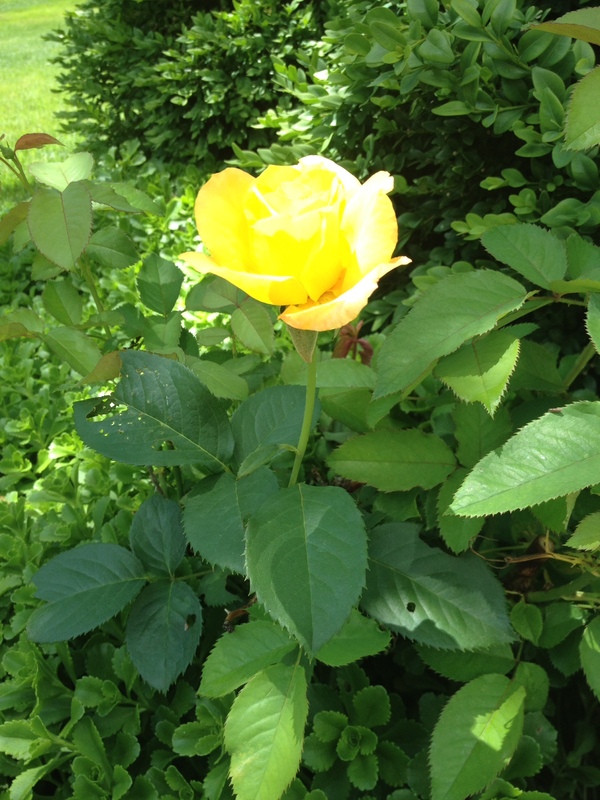 A yellow rose. My mother’s favorite. Much like the single bud of a beautiful flower, my mother’s life was budding into motherhood when her fragile mind was struck by a chronic illness far too much for her to bare. If you’ve been a faithful reader of mine then you already know. Early on, I wrote a post touching on this, http://wp.me/p41md8-6Q. Typically, there is a “trigger,” that breaks down one’s mind. The person can handle no more. “Enough,” it says. “Please, I need a rest.” Until the next, unless the mind is treated. My mother was never treated. She was never aware there was such a thing. Truly, she believed they would take her away, never to be returned to her loving family. How sad for her. How sad for all of us. Such a waste of much of my mother’s joy and happiness. As a very little girl…..4-5-6 years old….was that when it first began? My earliest memory of this is of my mother writhing in pain, begging my father not to call the doctor…or was it an ambulance? He had one hand on the black phone with the curly cord. “No,” she cried. “I don’t want the ‘white coats’ to get me.” Terrified, she was. I have this picture of her grabbing hold of my father…his arm? His leg? Not letting go. He was in pain, too. At a loss with what to do. Trying his best to comfort her. I remember him sitting on a chair or the bed. His head down defeated. Dark, messy hair in big hands. Many times, my father wondered what to do? He was overwhelmed, yet strong, loving and true. Such a young man when all of this began. No education available back then. He knew only that his loving young wife was sick. He had a full-time job together with three young children…babies, to be responsible for. “Bad Nerves” was the term most often used for my mother’s condition back in the 1950’s. People did not talk about mental illness years ago. Even today, there is a major stigma attached to it. Shhhhh…Mental illness is no different from my oldest son’s diabetes or my youngest son’s asthma. If you need help, do not be afraid. See a doctor. Get therapy, take your medicine, seek treatment, or all of the above….please. A sick mind is an illness not to be ashamed of. It is no one’s fault. Least of all yours. Because education was little at best, and access to help was next to impossible, my mother suffered the whole of my life. I don’t have any proof of her illness. No doctor’s reports, no test results or hospital admissions. Still, my memories and research are enough for me. So many years of life she missed! Days spent in bed behind a closed door or rocking back and forth swallowed within the safety of her favorite chair. My siblings and I have gotten through life just fine. A few of us have stumbled here and there, but nothing like my mother went through. Of course, we were all educated and knew when to get help. Our mother taught us well. We learned from her, not necessarily from what she said, but in how she loved us in spite of her illness. She did her best and tried even better. She loved us all, 1.2.3.4.5. Good memories outweigh any that may be discolored. God has a way of doing that. So glad…. In Heaven, He covers my mother’s forehead, quieting her mind. No more anxiety, no more demons, no more suffering. 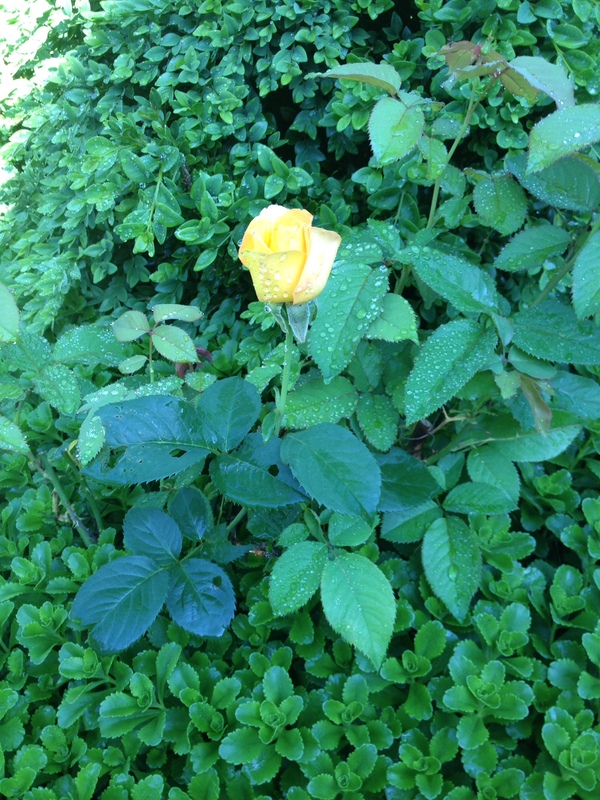 This single yellow rosebud is a reminder to me of my loving mother. 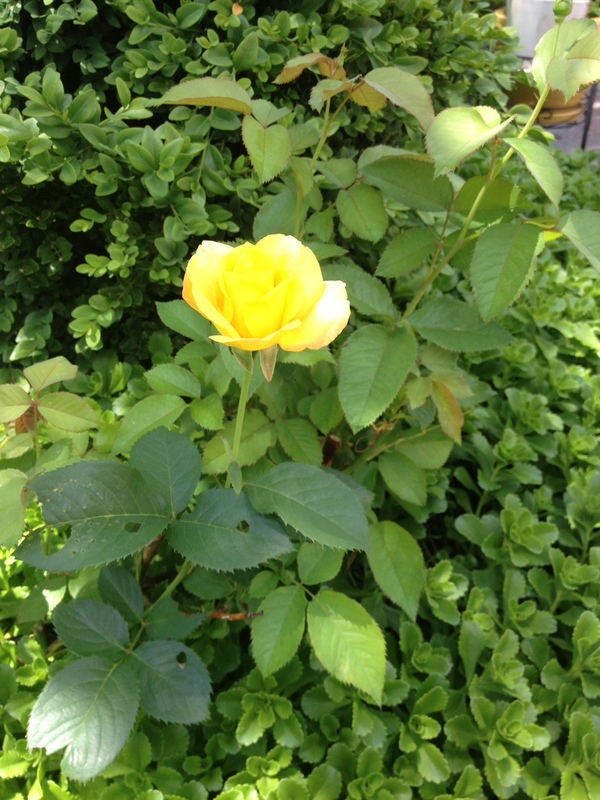 The first of the season…. Another View for My Mother…. This morning, after writing about my mother and brother yesterday, I remembered an incident that happened even before my little brother’s surgery. It was the summer of 1959. I was three years old, making him barely two, still wearing diapers. I can picture him, shirtless and barefoot, long before Pampers were invented.